Age:0-6 years. For the first time, this is a story where children can see themselves within their very own family, with mom and dad in everyday life. It depicts a charming story of a typical day out to the park: playing in the sandpit, a trip on the carousel, enjoying an ice-cream. Book description : 26 pages, size: 20 cm X 20 cm, with thick high quality paper, using professional digital printing and a durable laminated cover. Age: 0-6 years. For the very first time, this is a story where children can see how they fit in with their very own family. 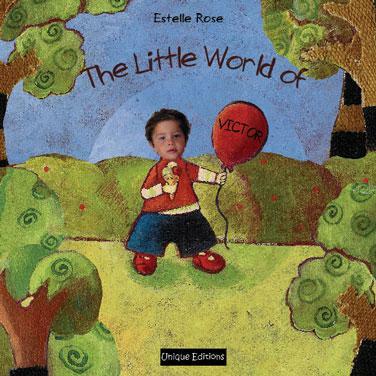 The book tells a tale about toddler, Mum and Dad in their everyday life. It depicts a fun visit to the park, a trip on the carousel, and some playtime spent in the sand pit. Your child squeals for ice cream and her brother or sister rides on the back of a green dragon. The illustrations use the rich and varied textures of mixed media to create a world that is as magical as your toddler is. Personalisation : The photo and the name of the child appear 10 times. Mom's photo appears 3 times and Dad's appears twice. The photo and name of the brother or sister appear twice. There is also an option to create your own personalised message to the child, that appears at the beginning of the book. As your toddler learns that he has an important part to play in his family, this personalised book shows him that he is a treasured part of a larger whole. "If children miss the thrill of reading when they're little, it becomes very difficult for them to recover. Studies show that children with strong reading and writing skills and a love of books are more likely to be successful in school and into their adult lives," says the Children's Literacy Foundation after several studies. Today, morals have returned to children's books, heavily cloaked in entertaining stories. In personalised book form, these morals are easier for children to relate to and integrate. They also make it far simpler for parents to discuss life lessons with their children in an accessible way. It's these conversations that place a strong moral thumbprint on children's value systems. Unique Editions publishes top class personalised story books for a highly discerning audience: children. Kids demand a great tale and they're unforgiving of naïve illustrations. Only professional children's authors and illustrators do for these fussy readers. Unique Editions knows that feebly imagined books will be ignored in favour of comics and movies. In partnership with It's Your Story, this publisher has been introducing a passion for reading to children for five years.